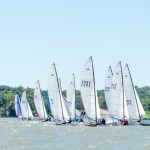 Competitors were greeted with breezy conditions, warm temperatures and sun as they rigged their boats for day one of the Hobie 16 and Hobie 20 North American Championships but it was “not to be”. 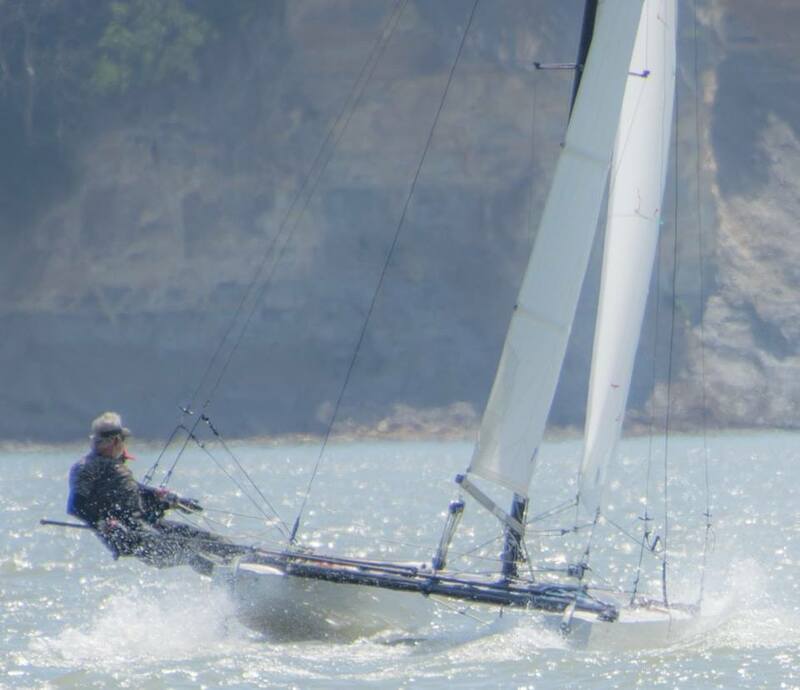 Shortly after racing started the breeze moderated resulting in a shifty up and down condition with large shifts and wind velocity varying from 5 to 15+ knots. It quickly became a game of chutes and ladders as sailors struggled to stay in the favorable breeze. The north shore ultimately ended up being the favored side. A quote of the day “this is the North American championships and it’s supposed to be hard”. 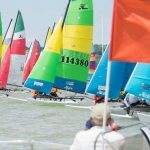 53 teams are competing in the Hobie 16 class, including two last minute entrants from Cuba and 21 teams are competing in the Hobie 20 class. 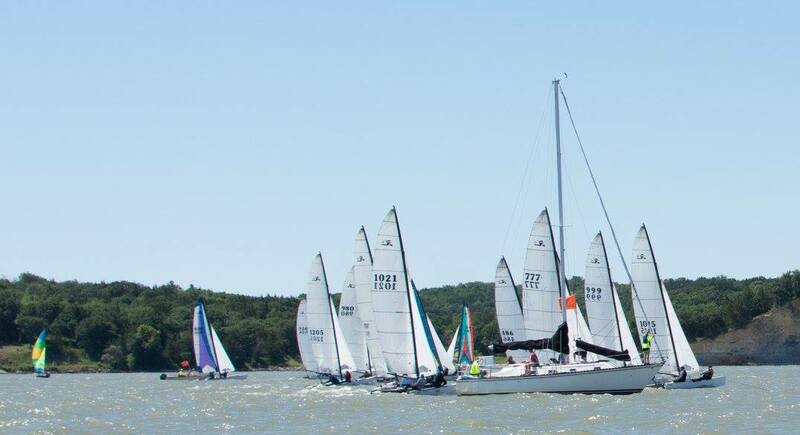 Three races were completed for the Hobie 16 class and four races for the Hobie 20 class. 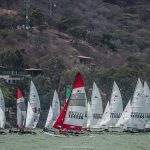 After day one in the Hobie 16 class Enrique FIGUEROA/Francesca VALDES (PUR) lead followed by Mike MONTAGE/Kathy WARD (USA). In the Hobie 20 class Mark and Kim ZIMMER (USA) lead followed by George PEDRICK/Gene HARRIS (USA). Racing continues through Friday. The second day of racing in Yankton, SD continued the chutes and ladders theme but with some get of jail cards thrown in. There was plenty of opportunity to go from the front to the back or the back to the front. On the course positions changed frequently. 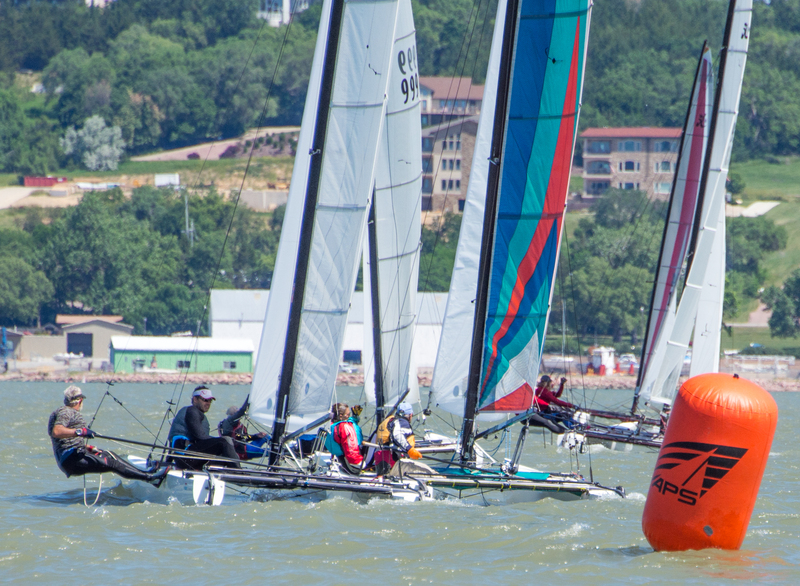 On-off shifty winds from 5-10 knots with a slow persistent right shift frustrated sailors and race officers alike. The early morning breeze moderated as competitors left the beach resulting in a very unstable breeze. I supposed they call this “lake sailing” for a reason. Despite the shifty frustrating conditions, the standings are very tight in the top ten and the good sailors are figuring it out. 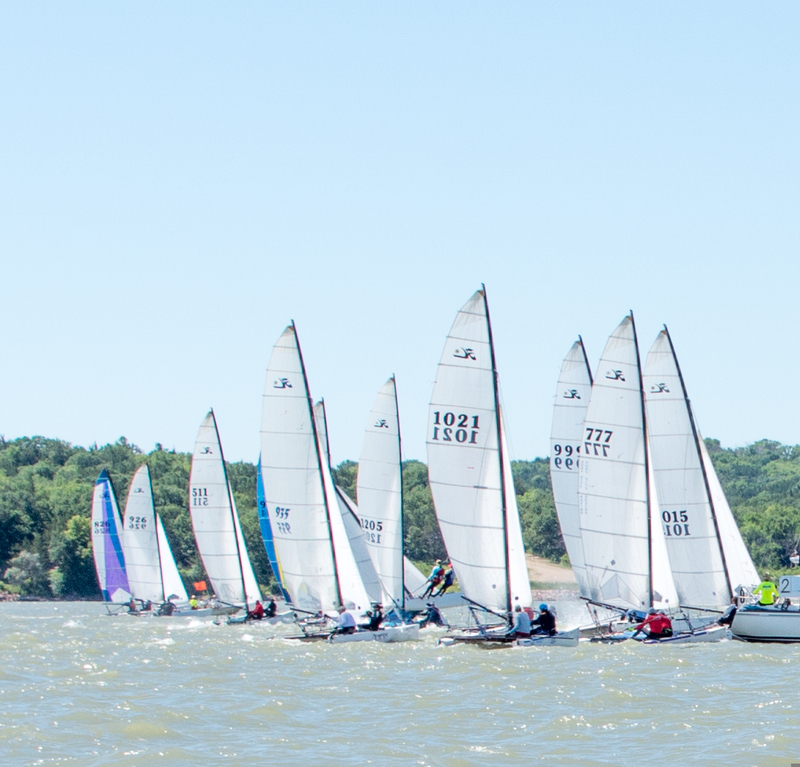 In the last race of the day, the wind radically shifted left forcing the entire Hobie 16 fleet into a last minute fire drill as all the teams flipped to port in the final seconds of the start sequence. The forecast for tomorrow is for breeze from a completely different direction, which will be welcomed by all. 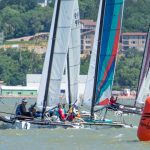 In the Hobie 16 fleet, Enrique FIGUEROA/Francesca VALDES (PUR) continue to lead followed closely by Mike MONTAGUE/Kathy WARD (USA). In the Hobie 20 fleet, Mark and Kim ZIMMER (USA) continue to lead followed by George PEDRICK/Gene HARRIS (USA). 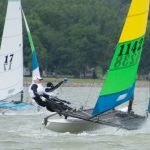 The third day of racing in Yankton, SD provided a fresh wind direction and some fresh breeze that created smiles for all. 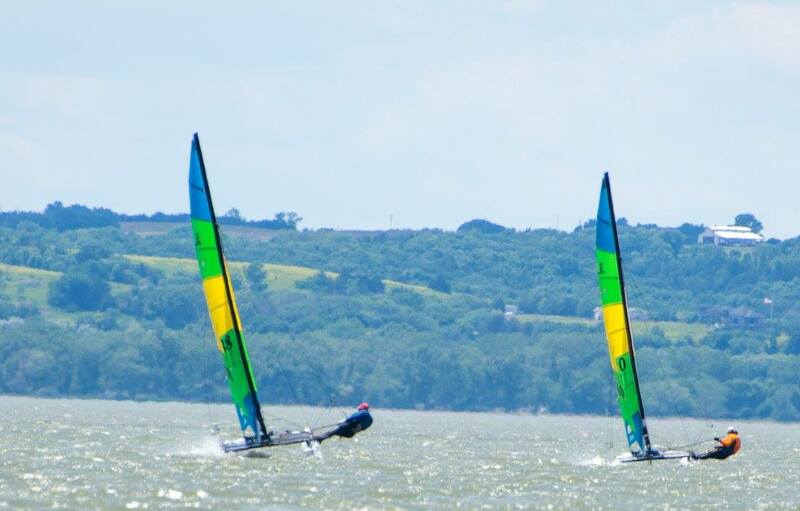 Three races were completed in the Hobie 16 fleet and Hobie 20 completed two races. 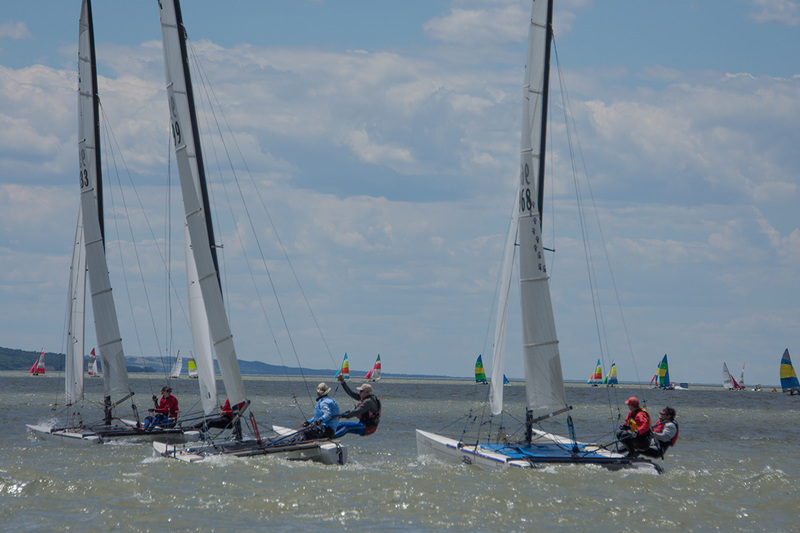 The first race of the day was 15-20 knots from the south east and ideal Hobie sailing conditions. Latter in the day the breeze moderated to 10-15 knots. While the wind was more stable than the last two days there was still plenty shifts and passing opportunities. 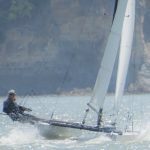 The downwind legs were frequently a gybing duel as sailors tried to stay in the best wind. Upwind legs offered big passing opportunities for those who could find the favorable shifts. Over the course of a single race positioned changed frequently and it was a challenge to consolidate and hold your position. The standings are tightening as everyone has some big numbers on their score card. 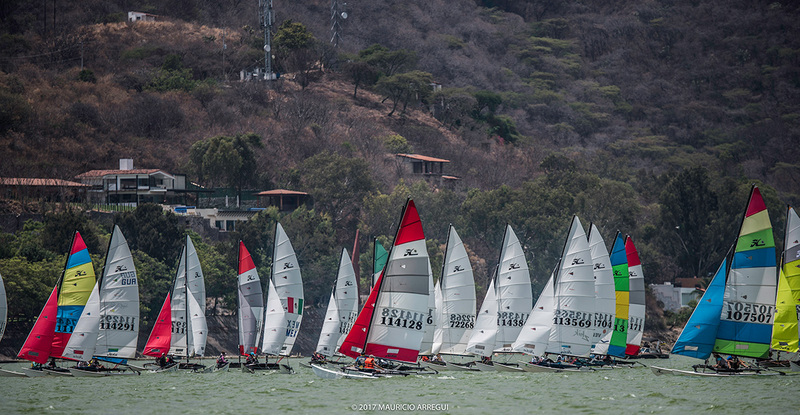 In the Hobie 16 fleet, Enrique FIGUEROA/Francesca VALDES (PUR) continue to lead followed closely by Ben BROWN/Casey ASTIZ (USA). In the Hobie 20 fleet, Mark and Kim ZIMMER (USA) continue to lead followed by Jacob SAILOR/Fey REN (USA). Racing continues through Friday and breezy conditions are forecast for the next two days. 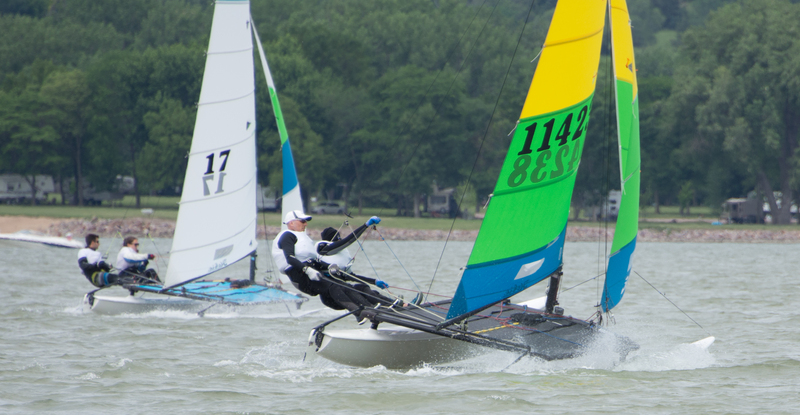 Racing continued in Yankton, SD for the Hobie 16 and Hobie 20 classes. 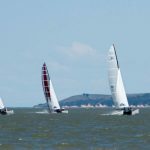 Strong wind in the early morning forced a one hour postponement, however the wind quickly moderated and racing got underway in 10-15 knots. The first two races of the day provided some of the best conditions, we have seen all week as the wind was far more stable. 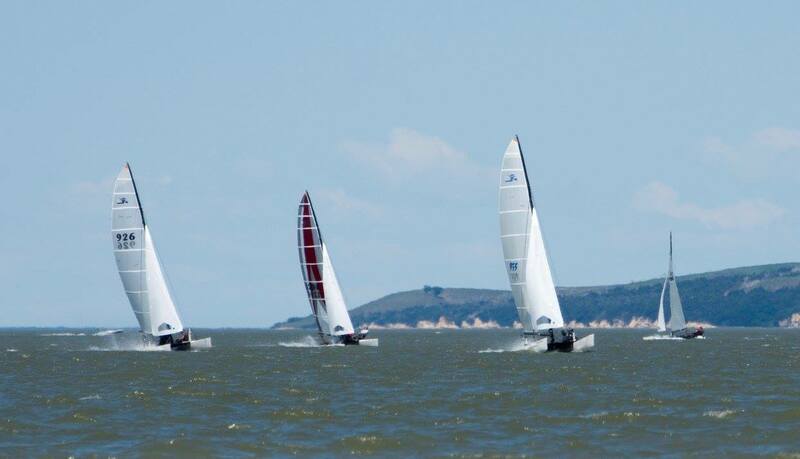 Both fleets enjoyed some tactically challenging conditions in nice breeze. 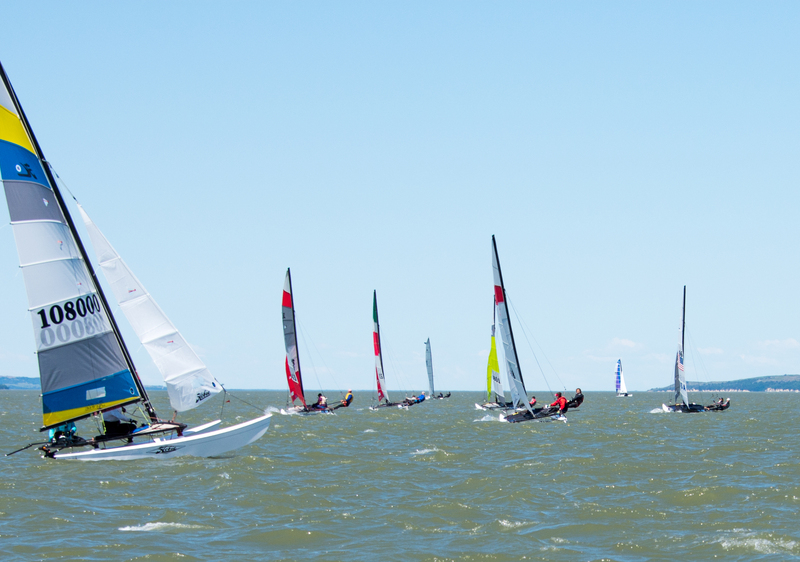 At the start of the third race of the day for the Hobie 16 fleet, everything changed. With approximately two minutes remaining before the start the wind shifted hard to the left and came on at 25 knots. 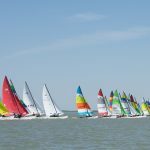 With the fleet all lined up for a starboard approach to a port favored line, the move was to tack as quickly as possible but this is easier said than done with all the boats in close quarters parked on the start line. A few boats made an escape at the pin and were gone. What ensued was a tight reach to the weather mark followed by a very hot reach back to the leeward gate marks in a very gusty 25 knots of wind. Upwind and downwind boats were crossing head-on at high speeds. 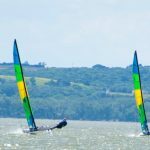 Meanwhile the Hobie 20 fleet decided this was not a game they wanted to play and the fleet collectively decided to retire. Racing concluded for the day following this as the wind continued to increase. In the Hobie 16 fleet, Enrique FIGUEROA/Francesca VALDES (PUR) continue to lead followed closely by Ben BROWN/Casey ASTIZ (USA). 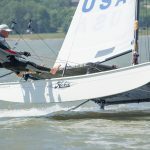 In the Hobie 20 fleet, Mark and Kim ZIMMER (USA) continue to lead followed by Jacob SAILOR/Fey REN (USA) and John HOLMBERG/Teri MCKENNA (ISV) who are tied for second. Racing continues through Friday and breezy conditions are forecast for the final day. 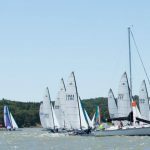 The final day of sailing at the Hobie 16 and Hobie 20 North American Championships was not to be. 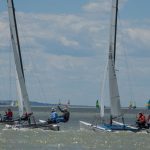 Strong winds (25-35 knots) forced a cancellation of all racing for the final day of competition. 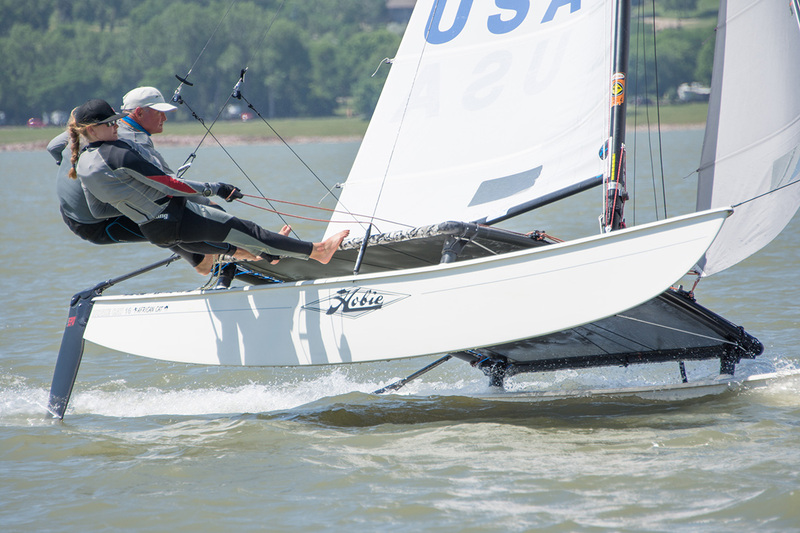 The Lewis and Clarke Reservoir in Yankton, SD proved to be a challenging place to sail with a variety of wind conditions. 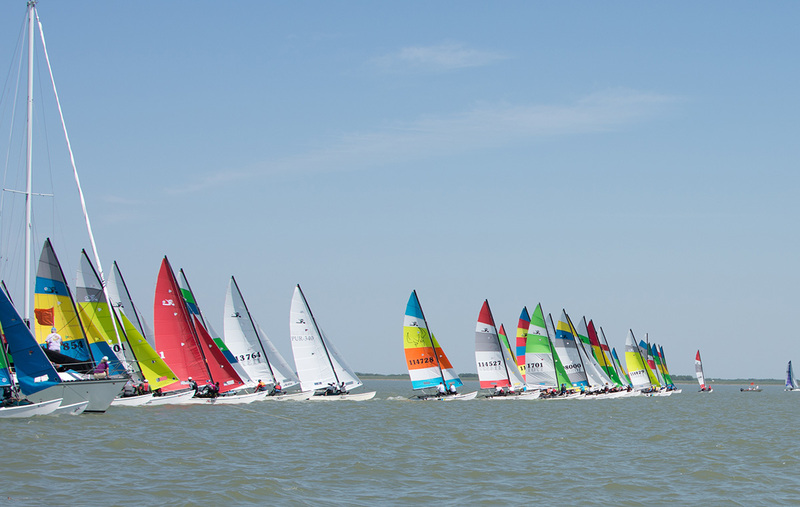 Thirteen races were completed over a period of four days with winds varying from 5 knots to 25 knots. 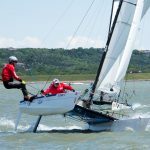 The shifting winds provided tested the sailor’s ability and stay in the most favorable winds and despite the sometimes frustrating conditions the best sailors found their way to the top. 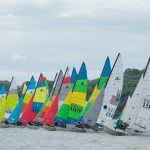 In the Hobie 16 fleet, Enrique FIGUEROA sailing with Francesca VALDES (PUR) wins his 10th Hobie 16 North American championship followed by Ben BROWN/Casey ASTIZ (USA). 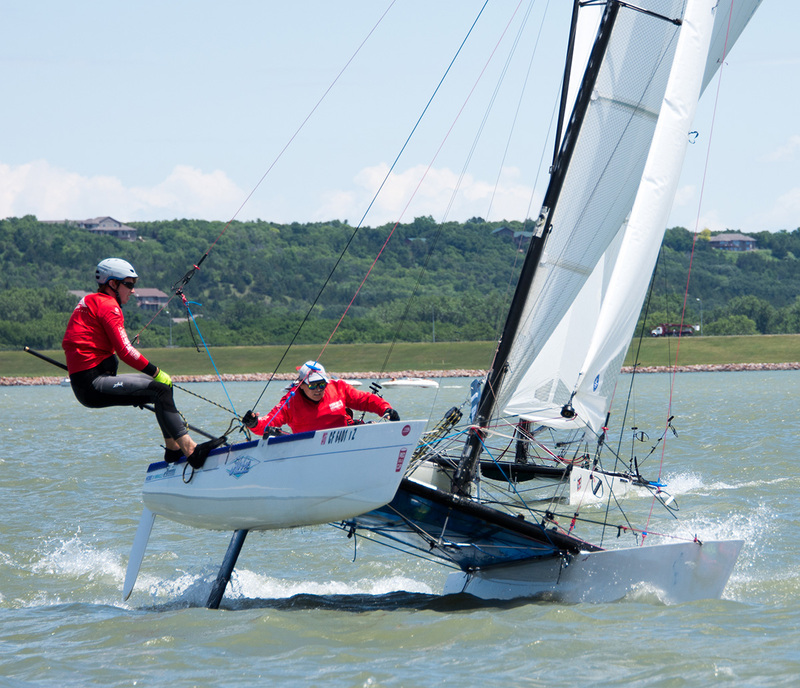 In the Hobie 20 fleet, Mark and Kim ZIMMER (USA) are the new championships followed by Jacob SAILOR/Fey REN (USA). 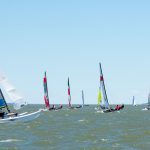 In 2018 the Hobie 16 class will hold their championship in Navarre Beach, FL.